My After Christmas Sale Picks! I hope everybody had a wonderful Christmas with friends and family! I hope you laughed way too much, ate way too much, snuggled up with loved ones WAY more than normal, and opened all sorts of presents that you loved. And I of course hope that you took some time to be thankful for the real meaning of Christmas. I had such a wonderful Christmas day and just couldn’t convince myself to pick up my computer, so I woke up bright and early this morning and scoured the sales! I know all the deals that are out there right now can be overwhelming, so I’m just going highlight what I consider to be THE BEST OF THE BEST! If you’re like me, you have an Amazon gift card you received yesterday that is already burning a hole in your pocket! New deals were released today, and this Kindle fire is now $30 off, making it just under $50! This Echo is $30 off too! And if you really want to treat yourself, you can save $120 on this Dyson stick vacuum! And again, if you have a gift card to spend, hop over to my first ever Amazon haul! 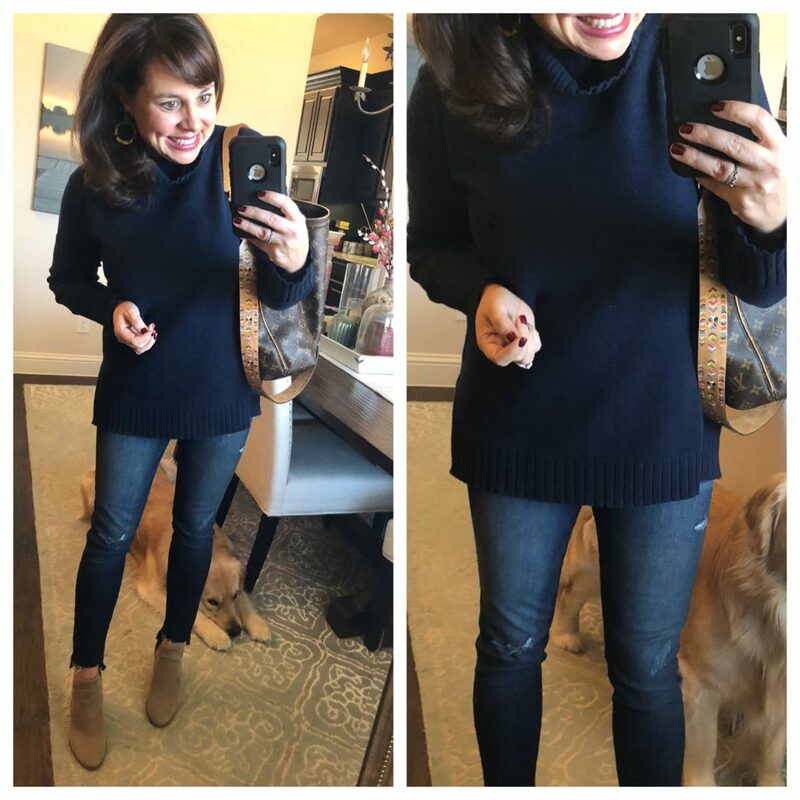 This sweater (three colors are still in stock), these leggings (head to the post for my review), and these earrings (in the tortoise shell) are on repeat. Nordstrom’s Half Yearly Sale has started, and dang there are some amazing deals to be had! These over the knee boots (with great reviews!) are now just under $80! UNDER $80! For over the knee boots! THIS TOTE is 50% OFF. The black with the taupe stripe is my favorite. For all of you Wit and Wisdom fans out there, THIS PAIR of ankle jeans with a frayed hem are 50% OFF! 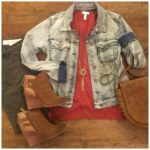 This great suede moto jacket is 40% OFF! I love the edgy style, and the “casablanca” color is an awesome neutral and my favorite. THESE Gorgana hoops with the beads are a whopping 60% OFF! Only 28 available though, so hurry! THESE J Crew pajamas are DARLING and 40% OFF. My favorite are the grey with the white dots. You know I love my Hunter rain boots. This shorter yellow pair just went 50% OFF, making them just $75!!! Have you always wanted a pair of Frye boots? They are on super sale now. I love the cognac. This cozy sweater has great reviews and is now under $40! Check this out! 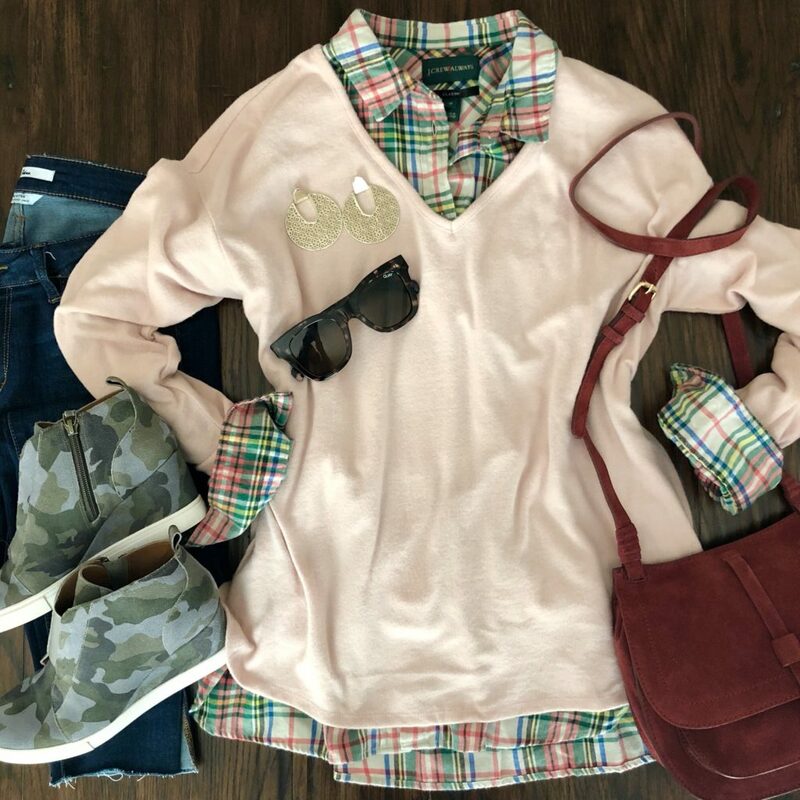 The plaid top and the bag are both 50% OFF! Click HERE to get to the original post with all of my thoughts and sizing information. On the post, I also share all the details on what I think is the perfect red lipstick. This waterfall faux suede jacket is 30% OFF (and comes in several colors). The cords and the must have denim jacket are NOW ON SALE! And here’s some big news! The Gibson Holiday Glam collection is 40% OFF! WHOAH! Click HERE to see all of the signature pieces worn by the bloggers that they are named after. You know my favorite is of course The Sheaffer Top (NOW 40% OFF!). 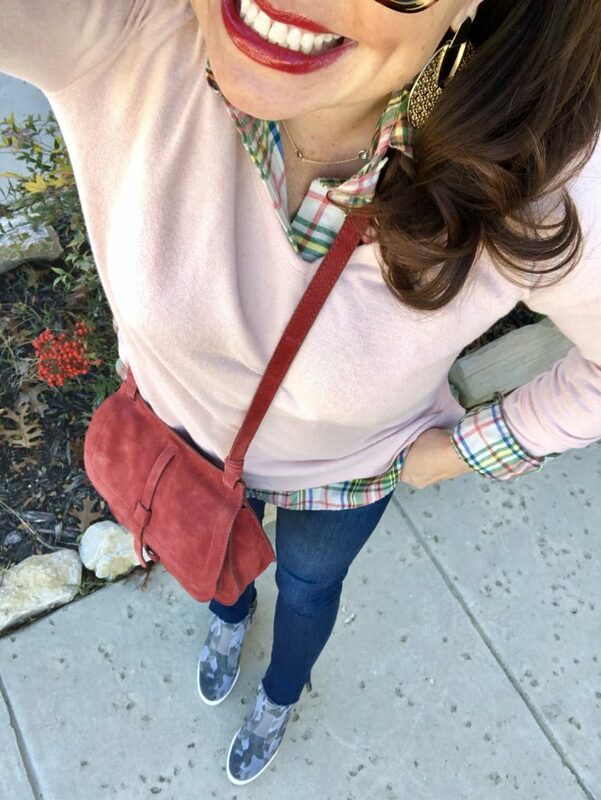 The cranberry colored top was beautiful on so many of you during the holidays (thanks for tagging me on social media so I could see! ), and the black and the white are definitely year round tops. You could wear this white one all the way in to spring and even summer! Here’s a fun group shot highlighting lots of the tops! Click HERE for the entire collection. You can also click HERE for a recap of my trip to L.A. when we shot the collection! 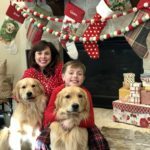 Colleen Rothschild is 20% OFF site wide with the code BYE2018. I actually gifted several Colleen products this year to family members that have also become Colleen devotees. I introduced them to new products they haven’t tried yet, and I’m sure they will now have some new favorites in their rotation. If you’re new to Colleen and want to spend some Christmas money to try it out, I recommend starting with the cleansing balm. I actually look forward to washing my face at night. 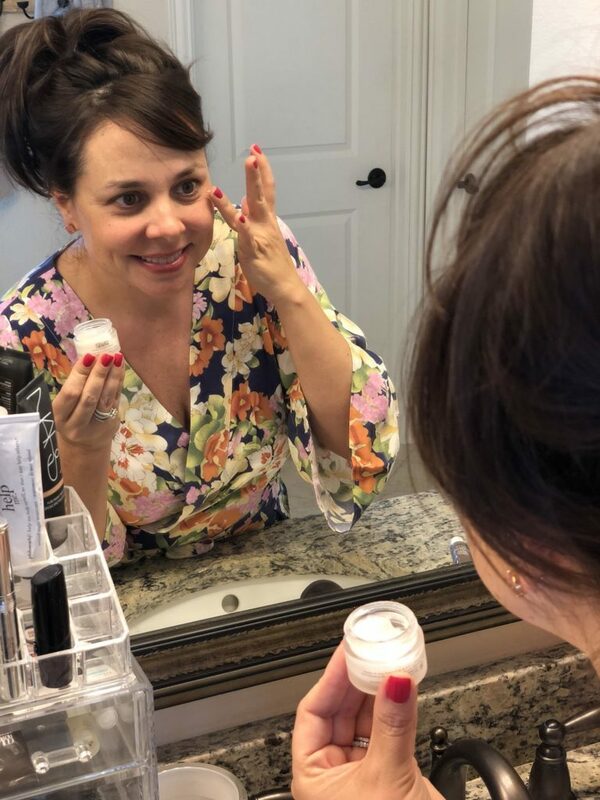 Click HERE for a previous Colleen Rothschild post that breaks down lots of my faves and where Colleen herself weighed in with recommendation for my a.m. and p.m. routine! Macy’s has a huge AFTER CHRISTMAS SALE going down right now! Lots of packable jackets are 50% OFF (for a limited time)! And one of my favorite military jackets that is now 40% OFF! Size down for sure, I’m wearing an x-small, and I’m never an x-small in jackets. Click HERE to see the original post to read all my thoughts and sizing information. I treated myself to this wood board for my kitchen right before Christmas, and Chris and I both love it! And now it’s on super sale! It would be great for charcuterie boards, but we leave it out right behind our sink as decoration. 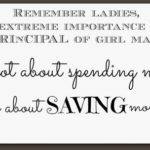 Ann Taylor has tons of items marked down! 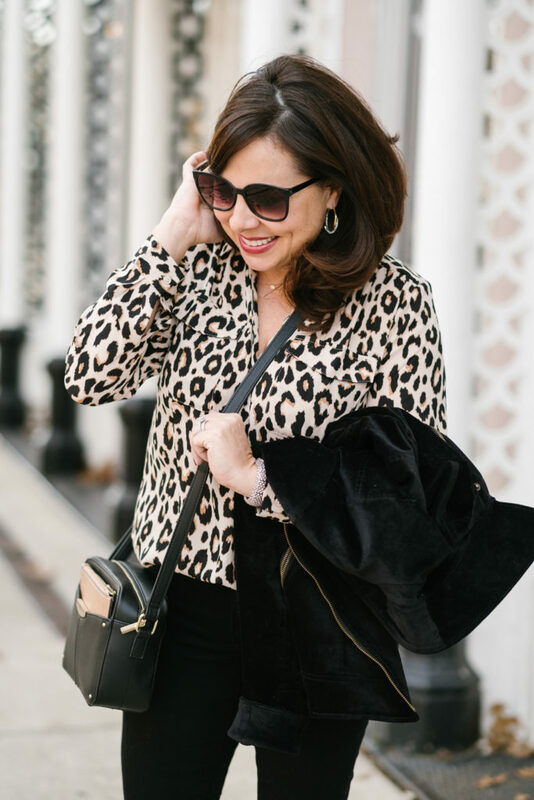 Click HERE for my recent post with Ann Taylor. I highly recommend this blouse. I think it’s totally chic and timeless, and now it’s 40% OFF! 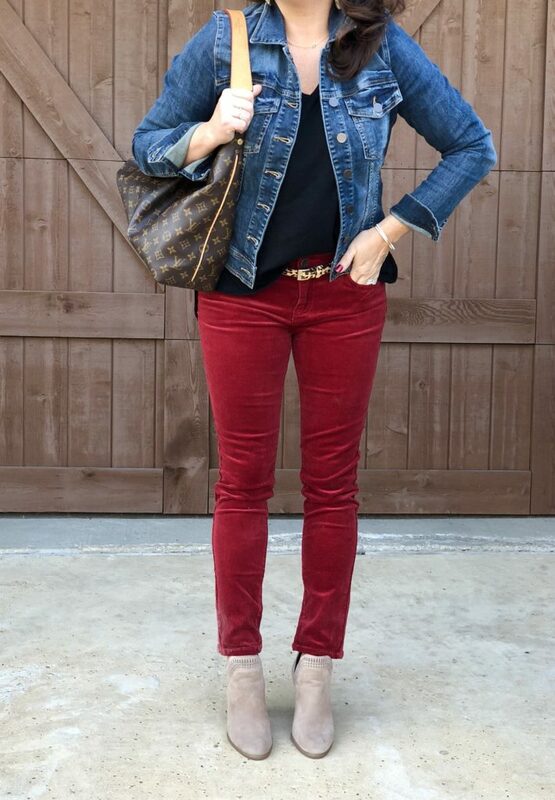 In fact, almost everything I’m wearing is on sale, and the velvet moto jacket is ON SALE, and then an additional 60% OFF! Do you remember Conner’s most recent WORK WEAR post? Head over to it now, because almost everything is 50% OFF. 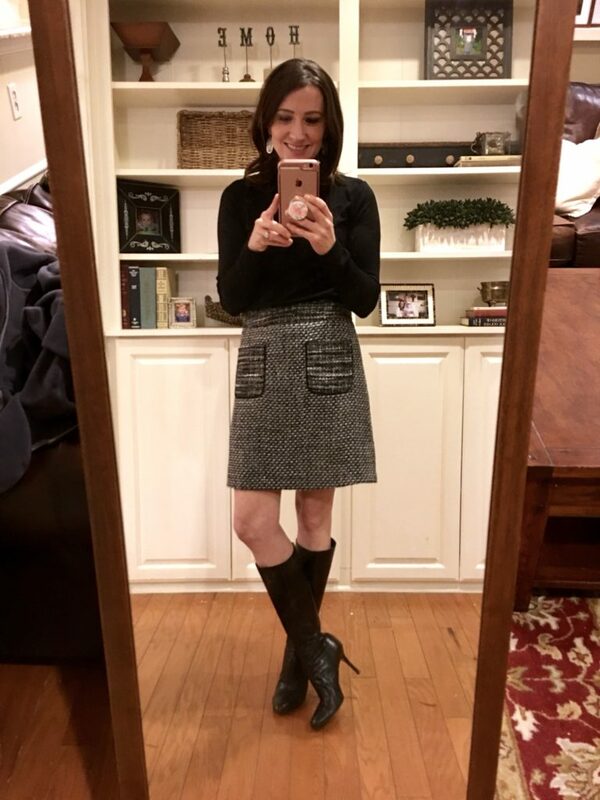 Here was one of my favorite outfits…. 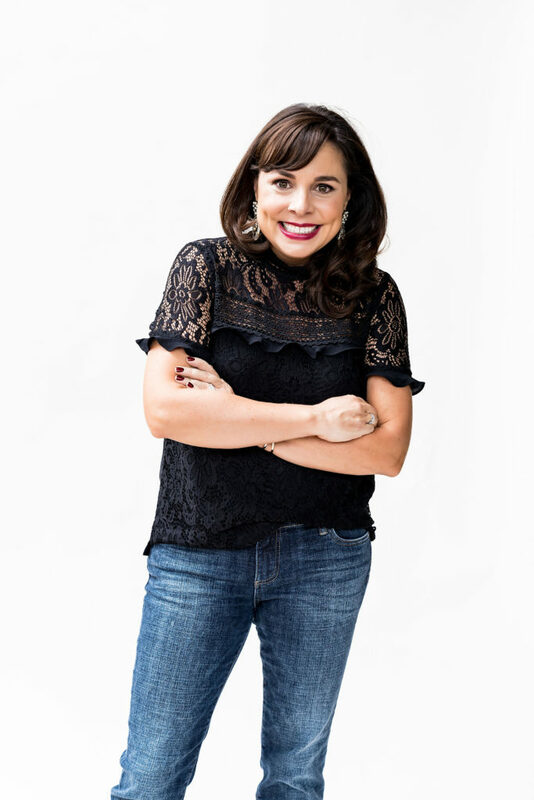 Do you remember my post with Gap, Old Navy, Banana Republic, and Athleta? TONS of items I showcased are NOW ON SALE! 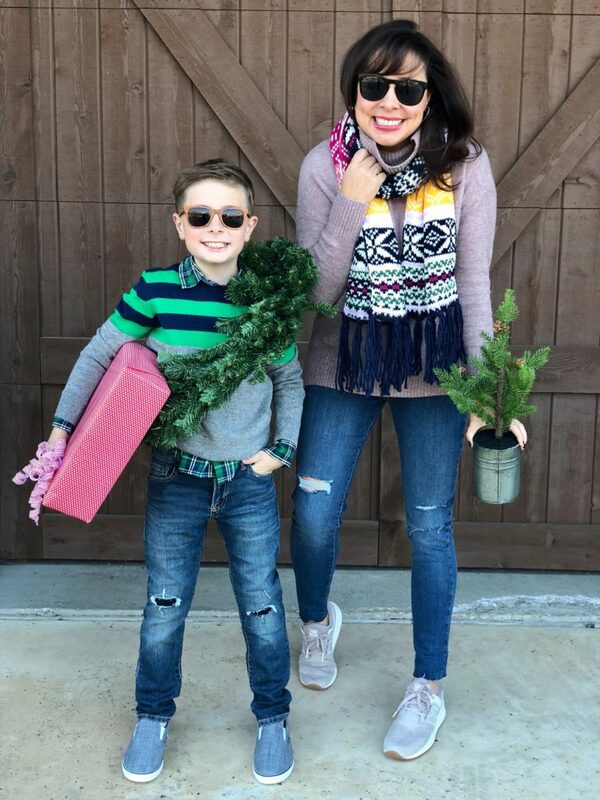 Head to the post to see lots of sweaters and scarves that are both DARLING and ON SALE! If you’re an Anthro girl, click HERE for their NEW TO SALE items. All right! That’s it for today, ladies! Back to family time , lots of game playing, and extra snuggles! 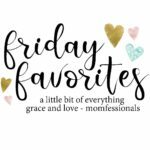 Friday Favorites: LOTS of SALES and SALE CODES! 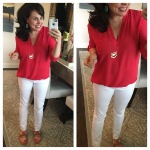 WHITE JEANS FOR THE WIN! Hi and Merry Christmas!! Any idea if the slim profile UGGs will be restocked? I got my true size 8 and they’re too tight, but 8.5 is sold out now. Thanks!! Same exact thing happened to me. I ordered a pair in 8 when they were on sale and had to return them. Nordstrom was out of 8.5. I found them on Zappos. I opened them for Christmas and have been wearing them today to loosen them up. They feel snug, but not unbearable. Hoping that will do the trick.